DISCONTINUED. The Glow-Worm Ultracom2 30kW cxi is a top of the range condensing gas combination boiler with a digital display designed for efficiency and ease of use. If you require a powerful boiler to heat your hot water but don't have the heaviest of heating needs this could well tick your boxes. A rated for efficiency with a SEDBUK rating of 89.3% this natural gas boiler is compatible to run on LPG if you live in an area that doesn't have a mains gas supply. Better still it doesn't require a conversion kit either. 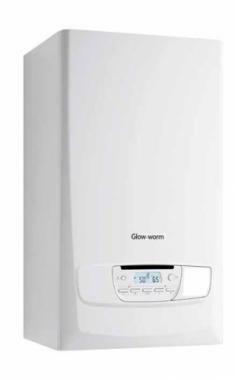 Depending on your heating and hot water requirements the Glow-Worm Ultracom2 cxi range has a boiler to meet your needs. Outputs range from 24kW to 35kW. Small and compact enough to be installed in most standard kitchen cupboards its dimensions are 74x42x35. At 37.7kg the boiler is of an average weight and is designed to be mounted on a wall. The boiler is very flexible when it comes to options to control your heating. There's an on/off button mode selector rest button and temperature adjusters for heating and hot water. The heating and hot water can be operated separately. The Glow-Worm Ultracom2 30kW cxi is compatible with both digital and analogue timers or you can use a wireless programmer. The Energy Savings Trust recommend this boiler.